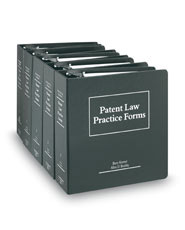 This set provides easy access to all the forms, rules, and commentary needed to prosecute a patent application before the United States Patent and Trademark Office and to litigate a patent case. This reference contains the full text of the Rules of Practice in Patent Cases, the Federal Rules of Civil Procedure, hundreds of practice-tested forms that clearly illustrate the correct procedures under each rule, and extensive editorial comments and annotations throughout. This reference analyzes and provides forms for the following areas: originating an action, the pretrial process, judgment issues, and a stay of proceedings to enforce a judgment.